Articles in medical journals tend to pay scant attention to the role of nurses in treating illness—or for that matter, to the role of social workers, physical therapists, and many other clinicians. Hence, when JAMA, one of the major American general medical journals, published an article in 2002 entitled, “Hospital Nurse Staffing and Patient Mortality, Nurse Burnout, and Job Dissatisfaction,” it was a bombshell. 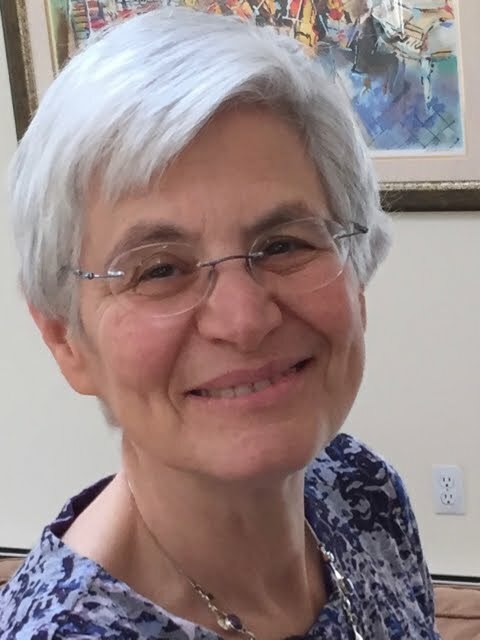 The lead author, Linda Aiken, is a nurse researcher at the University of Pennsylvania where she is a Professor of Sociology and the founding director of the Center for Health Outcomes and Policy Research. Looking at survey data from 10,000 nurses and administrative data on nearly 250,000 medical and surgical patients hospitalized in Pennsylvania in 1998-1999, she drew some dramatic conclusions: each additional patient per nurse was associated with a 7 percent increase in the likelihood of dying within 30 days of hospitalization, and each additional patient per nurse was associated with a 23 percent increase in the odds of “burnout” and a 15 percent increase in nursing job dissatisfaction. Aiken's analysis, along with other smaller studies, have led to calls for an increase in the nurse to patient staffing ratios in hospitals. In light of general hospital administrative reluctance to make such increases, many nurses have demanded and some state legislatures have proposed mandatory increases in nurse to patient ratios. Massachusetts voters are being asked to vote this November on a referendum that would establish mandatory staffing ratios. To date, the only state to have instituted such a requirement is California—which passed legislation in 1999, before Aiken’s landmark study. California’s experience offers an unparalleled opportunity to ask whether mandatory ratios result in the desired improvements in quality of care and whether they produce a variety of unintended consequences. In principle, it could also shed light on whether nurse to patient ratios are particularly important for older people. California’s law specifies different nurse to patient ratios for intensive care units, surgical units, and medical units. Compliance was at first uneven, but gradually hospitals conformed to the requirements. Several studies have attempted to assess the outcomes. They are limited because California did not conduct a randomized, controlled experiment before passing its legislation—it did not impose mandatory minimum ratios on some hospitals and not on others. Moreover, nursing staff ratios are hardly the only factor affecting outcomes that changed in the early years of the mandate: many other federal quality improvement initiatives were undertaken to encourage hospitals to prevent pressure ulcers, falls, catheter-related infections and other major hazards of hospitalization. 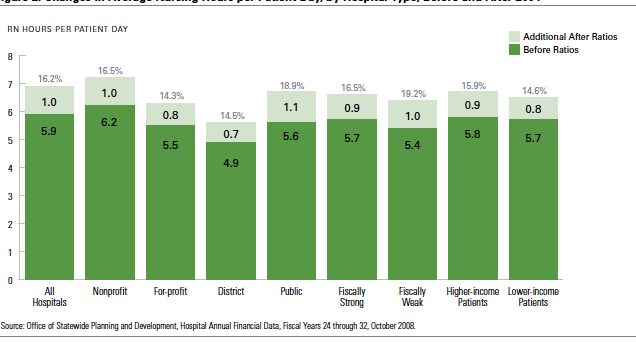 Hospitals have also experienced major financial pressures: the cost of hiring nurses was only one of many economic challenges. Determining cause and effect is not easy. Nearly twenty years later, what do we know? First and foremost, did the mandatory ratios result in improved quality of care? One of the most carefully performed studies was undertaken by the California Health Care Foundation, part of UCSF, in 2009. This report looked at pressure ulcers, pneumonia deaths, and deaths from sepsis (blood-borne infection) and were unable to find any statistically significant change after the law was implemented in 2004 (following a multi-year study period to design the regulations). Another study that focused exclusively on pressure ulcers and falls used data from CalNOC, a large nursing database for the entire state, to conclude there was no change in fall rates. They did note a paradoxical increase in pressure ulcers in patients admitted to “step-down” units, units between an ICU and a general medical or surgical floor in the acuity of their patients, after the requirement of more nurses per patient was introduced (presumably a reflection of sicker patients). A systematic review of the literature, published in the Annals of Internal Medicine in 2013, failed to find any statistically significant effect on a variety of safety measures. Of note, none of the studies I identified looked at either patient or nursing satisfaction. If mandatory nurse to patient ratios did result in more face-time with patients but no demonstrable improvement in overall quality of care, might older patients nonetheless be one subgroup that did benefit? All we can say is that many of the quality measures that were examined—pressure ulcers and falls, for example—are particularly relevant to older people. On balance, regulating nurse to patient staff ratios in isolation is not likely to make much of a difference in patient outcomes, nor is it likely to devastate hospitals' finances. Hospitals are complex institutions with many interrelated parts. Just because hospitals with low nurse to patient staffing ratios tend to have poorer outcomes than other hospitals does not mean that if we "fix" the ratio, care will necessarily improve. Assuring that there are enough nurses to provide good care is essential, but that step alone is unlikely to dramatically improve the hospital experience.